During the process of any genocide, there exists a power asymmetry between the perpetrators of the crime and its victims. This has led to the widely-held belief that the victims of genocide are powerless beings whose destinies are outside their control, passive individuals set on a course leading ultimately to death. In the case of the Armenian Genocide, the victims are regarded as having been helpless in the face of the massacres and death marches, and only humanitarian aid workers, mainly from the West, are perceived as having been capable of alleviating the Armenians’ pain. Dr Khatchig Mouradian contests this view, which has pervaded popular and academic discourse. 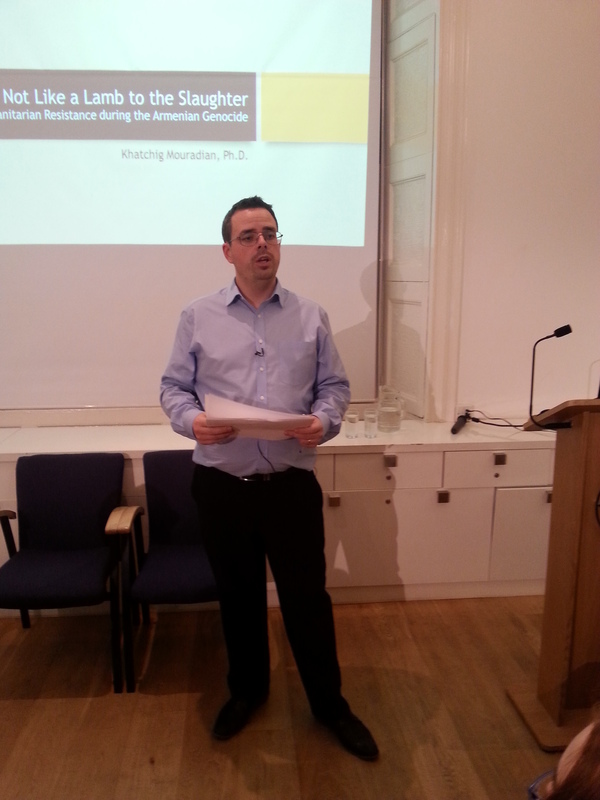 In his lecture, Dr Mouradian discusses the agency of those victims who initiated their own attempts at lifting themselves out of their abject situation, referring to these attempts as cases of ‘humanitarian resistance’. Khatchig Mouradian is the Nikit and Eleanora Ordjanian Visiting Professor at Columbia University. Previously, he served as the Henry S. Khanzadian Kazan Visiting Professor at CSU Fresno (Fall 2016 Semester). In 2015-2016, Mouradian was a visiting assistant professor at the Division of Global Affairs at Rutgers University. He has taught courses on imperialism, mass violence, and concentration camps in the History and Sociology departments at Rutgers. Dr Mouradian has also served adjunct professor at the Philosophy and Urban Studies departments at Worcester State University, where he teaches courses on urban space and conflict in the Middle East, genocide, collective memory, and human rights. 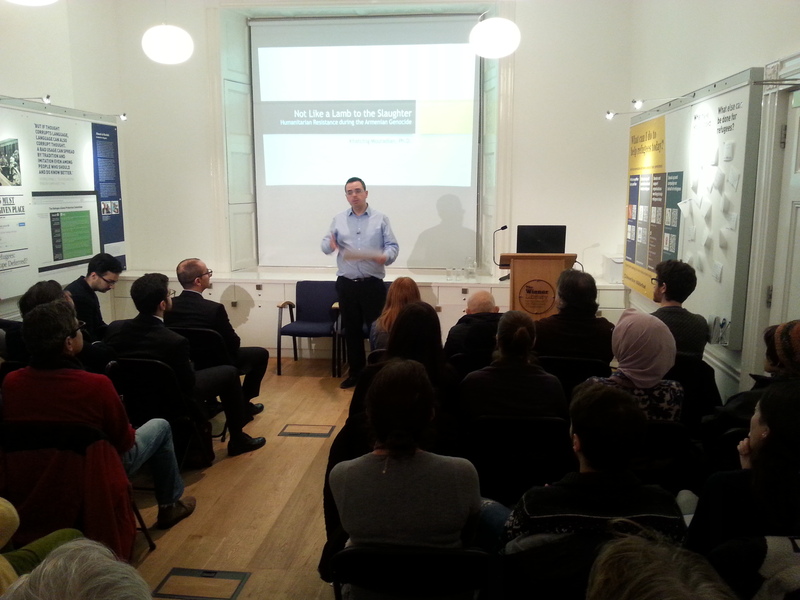 This lecture was co-organised by Dr Krikor Moskofian, director of the Programme of Armenian Studies, and Dr Christine Schmidt, deputy director and head of research at the Wiener Library. 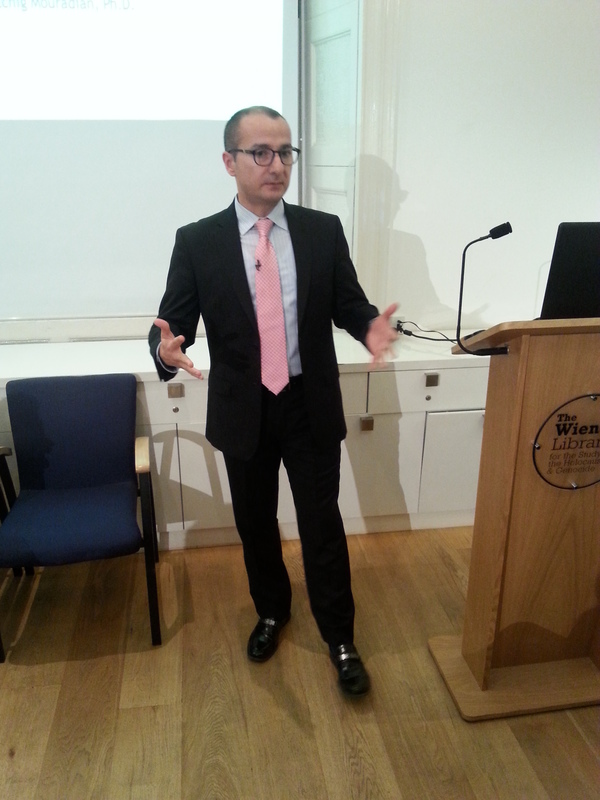 The event was held at the Wiener Library and was chaired by Dr Toby Simpson, head of digital. Dr Mouradian identifies the Aleppo–Ras Al-Ayn–Deir ez-Zor triangle as primary sites of humanitarian resistance, using the term humanitarian resistance since these efforts were undertaken illegally and against the will of the Ottoman state. In Aleppo in May 1915, the three Armenian churches formed relief committees as thousands of refugees entered the city. One prominent figure involved in these humanitarian efforts was Father Yessayan, who, with his group of volunteers, eld meetings and took highly-detailed notes on the refugees and their needs, in terms of food and shelter. Initially, these meetings were held without the knowledge of the true scope of the crime was being committed against the Armenians and the immense humanitarian crisis that was unfolding. During the first few months it was possible to show individual care to each and every refugee. However, this would become impossible later on; within months, hundreds of thousands of refugees would be entering into what is today Syria. Furthermore, it took the Ottoman Turkish authorities some time to catch on to the relief efforts, and even after they had, they did not pay particular attention to the actual destination of deportees. Starting in autumn 1915 this changed; the authorities began to crack down and force these activities underground, arresting organisers, banning organisations such as the Red Cross, and forbidding entry into Aleppo for deportees. Such efforts at self-relief made by Armenians themselves have been little studied – most of the focus thus far has been on Western humanitarian aid to Armenians. However, it had become difficult to enter and move around the Ottoman Empire even for outsiders, and so the Armenians in many places could not depend on outside help. Dr Mouradian mentions several other Armenian initiatives aimed at self-help, telling the stories of such figures as Reverend Eskijian, who dedicated his life to saving deportees until his death in 1916, when he succumbed to a disease. Women played an important role in the self-relief process since the larger part of the refugee population was female, the men having been killed in the military or in prisons. Dr Mouradian tells the story of a nurse, a deportee from Marash, who contracted typhus in Aleppo. She recovered after being treated by a local Armenian doctor and went on to become an exceedingly important figure since, having survived the disease, she had developed immunity to typhus, and so could freely treat refugees afflicted with it. She was then taken to the director of the Ottoman Army’s hospital, whose daughter was suffering with typhus. She cared for the daughter, who eventually recovered, and the director of the hospital made her head nurse of the one of the main military hospitals in Aleppo. Thus she was able to save the lives of numerous Armenian women by employing them in the hospital and preventing them from being deported. This is just one of many stories of Armenian women who used what means were available to them to provide relief for refugees. Next, Dr Mouradian discussed Aleppo’s Hotel Baron. The hotel – the oldest in the Middle East, according to some accounts – was established by the Armenian Mazloomian brothers, and saw a number of high-profile guests, including Charles de Gaulle and Agatha Christie. However, not only was it a landmark institution in terms of its clientele, it was also key to the humanitarian resistance efforts of the Armenians. Importantly, the Mazloomian brothers had good relations with Ottoman officials who stayed there, and so the brothers had free rein to assist in the accommodation of Armenian refugees. One interesting tale linked to this hotel is that of a group of Armenian children who were able to eke out a living next to the hotel’s rubbish dump, from which they would scavenge and consume other people’s leftovers. This story demonstrates the agency of the children in engaging in humanitarian resistance, who strived to survive no matter what situation they found themselves in. Such untold stories may struggle to gain significance due to the marginalised nature of those who lived them, but they are no less important in telling the overall story of the Armenian Genocide, and indeed in shedding light on the agency of all individuals and groups who receive little or no attention. The Ottoman crack down on humanitarian initiatives stemming from Aleppo and the arrests and exile of Armenians from the city to surrounding concentration camps was a blow to the relief effort. Nevertheless, a coordinated effort to provide relief began to take shape. An interesting case of Armenian agency is the positions of authority held by Armenians in the management of the concentration camps. There were several positions that Armenians could occupy: camp guard, transporter and undertaker. Ottoman Turkish camp directors reigned supreme. They were a source of corruption as they accepted bribes in exchange for allowing deportees to stay in one camp without being transported to another (deportees would normally be sent from one camp to the next until they reached Deir ez-Zor, which was synonymous with death). On seeing familiar faces, people from the same area would assist one another in the camps in terms of acquiring food, money or permission to stay. At the end of the lecture, Dr Mouradian showed a number of photographs he had taken around Deir ez-Zor. One was of a group of children in a village who had picked up some bones from the ground. When asked what the bones were, the children replied, Armani, Armani! – ‘Armenian, Armenian!’ in Arabic, a stark reminder that there are those who live amongst the consequences of the Armenian Genocide and still have local memories of these events. However, what Dr Mouradian wished to convey by showing this photograph was that, due to the war raging in Syria, those children could be anywhere at this moment. It is a reminder that the present day is no stranger to injustices like those of the past, and that we, as individuals or groups, have the agency to resist the injustices that occur around us. In the question and answer session, one member of the audience asked whether the traditional Armenian political parties played a role in the humanitarian resistance effort. In response, Dr Mouradian said that the Armenian political parties as organised groups did not participate in the humanitarian resistance, due to the outlawing of these parties and the mass arrest of their members. However, party members who had not been arrested did join in with the efforts, while not outwardly displaying their political affiliations due to the risks involved. Another audience member posed two questions. The first was related to the nature of the concentration camps, namely, whether or not they were, in fact, death camps. Dr Mouradian’s answer was that, first of all, it was the Germans who had used the term ‘concentration camps’ when describing the camps in their records, not the Turks. Secondly, mass killings did not take place inside the camps themselves; rather, people were taken out to be killed, or were murdered on the death marches. The second question concerned the extent to which the Great Powers were informed of the events of the Genocide, to which Dr Mouradian replied that they were very well informed indeed, thanks to the reports of diplomats and missionaries who collected information first-hand and from eyewitnesses. One example of an important resource in this regard is the so-called Blue Book compiled for the British government, in which are recorded hundreds of eyewitness accounts of the Genocide that was taking place. Finally, a question was asked about whether any Turks had been involved in rescuing Armenians from death. Dr Mouradian affirmed that, although the motivations of such individuals ranged from pure good will to financial gain, many Turks did indeed attempt to save Armenian lives, often at the risk of their own. By leonaslanov in Uncategorized on February 12, 2017 .